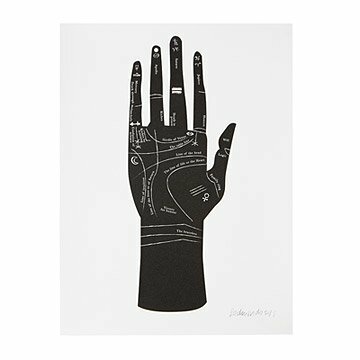 Let the future lie in your hands figuratively and literally with this palmistry screenprint. Let the future lie in your hands figuratively and literally with this palmistry screenprint. Signed and dated by the artist, this wall art piece details the meaning of the lines in our palms and the predictions they may hold. Whether you find palm reading fun or fundamental to your future, this mesmerizing design's astrological elements and cultural roots add a mystical presence to your decor. Made in Canada.